This walk is for ages 18 and up. This public trail easement on the north slope of Loma Alta is always a fantastic destination for both wildflowers and birds. The serpentine habitat near the beginning of the road hosts a diverse and colorful bloom. We'll take our time identifying the species found here, including a few rare plants. 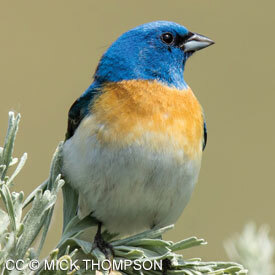 This area is also one of the best places to see birds such as grasshopper sparrows, horned larks, and lazuli buntings. Remember to bring binoculars, if you have them. Rain may cancel. If questionable weather, call (415) 893-9527 after 8am on the morning of the event to hear a recorded message if cancelled. We request that no pets (except service animals) attend. Directions: Meet at the Big Rock trailhead in San Rafael., From Hwy 101 in San Rafael, take the exit for Lucas Valley Rd west approximately 5.5 miles (look for the big rock). The gate is on the south (or left) side of Lucas Valley Rd.